Although laws governing the types of deaths to be investigated and autopsied differ from state to state, almost all deaths that are sudden, unexplained, or non-natural will be investigated. Whether or not an autopsy is performed in certain subtypes of these deaths is often determined by statute, precedent, custom, or discretion of the investigating agency. These "non-permit" autopsy examinations are distinct from those hospital deaths that are natural and for which the legal next-of-kin gives permission to the prosecting pathologist. The coroner system has its roots in the English colonial period of settlement in the New World, as the English brought their death investigation procedures of the 17th century with them, the coroner being the representative of the Crown (hence the title) in investigating death. Early American coroners attempted to apply current knowledge and common sense to death investigation; however, physicians were few, and the specialty of pathology and laboratory medicine was not yet extant. The first law authorizing the coroner to require participation of a physician in the death investigation process was enacted in 1860 in Maryland, and in 1868, a physician coroner was appointed in Baltimore. In most areas having a coroner system, coroners are elected officials and do not need to be physicians (with the exception of Kansas, Louisiana, North Dakota, and Ohio). Should an autopsy be warranted, the coroner will often consult with a pathologist or forensic pathologist. Medical examiners (MEs) are usually appointed and are physicians, although they may not necessarily be mandated to have special training in pathology or forensic pathology. The Model Postmortem Examinations Act in 1954 described a foundation to develop ME systems, but over half a century later, it has not been generally accepted or implemented. Subsequently, coroner/ME issues of education, training, funding, and legislation have been addressed in a 1968 National Research Council Committee on Forensic Pathology, a 1985 National Association of Counties conference, and a 2003 Institute of Medicine Workshop. Most recently, the National Academies of Science has published Strengthening Forensic Science in the United States: A Path Forward,  once again addressing the same issues as before, with many new ones added to the mix of discussion, including the application of existing and new technologies to forensic medicine and pathology. The types of death investigation systems in each state are shown in the following images, along with mention of features that make certain states unique. Among the 50 states, if a person wants to contact the titular head of each death investigation system, that person would have to telephone, e-mail, or send mail to more than 2000 individuals. The large number of systems is just 1 obstacle to the promotion of standardized practices throughout the United States. The shaded states have coroners in some or all counties. In Nebraska and some parts of Washington, the county prosecutor is the coroner. In some areas of California, the sheriff is also the coroner. In Kansas, the appointed physician Coroners serve districts of multiple counties. In New York, some counties may have more than one coroner. Kentucky, Montana, North Dakota, Arkansas, and Mississippi have coroners in all counties, but the state also has a state medical examiner. In Texas, justices of the peace may perform coroner duties. Idaho, Nevada, Colorado, Wyoming, South Dakota, Nebraska, and South Carolina have coroners in every county. The remaining shaded states have combinations of coroner and medical examiner systems. 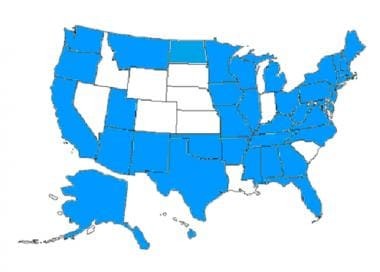 The shaded states have some form of medical examiner system serving the state or parts of the states. Alaska, Oregon, Montana, North Dakota, Utah, New Mexico, Oklahoma, Arkansas, Iowa, Kentucky, West Virginia, Virginia, Tennessee, Georgia, Alabama, Mississippi, North Carolina, Maryland, New Jersey, Connecticut, Delaware, Rhode Island, Massachusetts, Vermont, New Hampshire, and Maine each have state medical examiner offices. As shown in the previous image, some of the aforementioned states also have coroners, and Georgia and Alabama also have county medical examiners in one or more counties. The state medical examiner in Virginia, New Jersey, and Kentucky has district or regional Offices. Florida has 28 district medical examiner offices but no state medical examiner. Arizona and Michigan have medical examiners in each county, but these medical examiners may not be pathologists and may actually serve more in the capacity of a coroner. 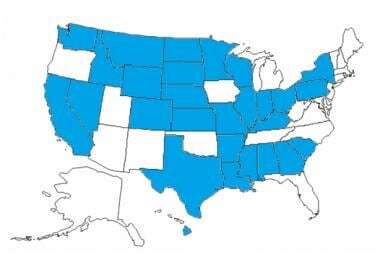 The remaining shades states (Washington, Texas, Hawaii, Minnesota, Wisconsin, Ohio, Illinois, Pennsylvania, and New York) have mixtures of coroner and medical examiner systems. The struggle continues to truly honor the deceased of our nation and the loved ones they leave behind, as well as our public health and legal systems, by providing all Americans with truly professional death investigation systems regardless of where they may live. Hanzlick R, Combs D. Medical examiner and coroner systems: history and trends. JAMA. 1998 Mar 18. 279(11):870-4. [Medline]. Nolte KB, Feddersen RM, Foucar K, et al. Hantavirus pulmonary syndrome in the United States: a pathological description of a disease caused by a new agent. Hum Pathol. 1995 Jan. 26(1):110-20. [Medline]. Hanzlick RL, Parrish RG. Epidemiologic aspects of forensic pathology. Clin Lab Med. 1998 Mar. 18(1):23-37. [Medline]. Fisher RS, Platt MS. History and development of forensic medicine and pathology. Spitz WU, ed. Spitz and Fisher’s Medicolegal Investigation of Death: Guidelines for the Application of Pathology to Crime Investigation. 3rd ed. Springfield, Ill: Charles C Thomas; 1993. 3-12. Hanzlick R. The conversion of coroner systems to medical examiner systems in the United States: a lull in the action. Am J Forensic Med Pathol. 2007 Dec. 28(4):279-83. [Medline]. Committee for the Workshop on the Medicolegal Death Investigation System. Medicolegal Death Investigation System: Workshop Summary. Washington, DC: The National Academies Press; 2003. [Full Text]. Committee on Identifying the Needs of the Forensic Sciences Community, National Research Council. Strengthening Forensic Science in the United States: A Path Forward. Washington, DC: The National Academies Press; 2009. [Full Text]. National Association of Medical Examiners. Available at http://www.thename.org. Accessed: November 14, 2009. American Academy of Forensic Sciences. Available at http://www.aafs.org. Accessed: November 14, 2009. The author would like to acknowledge Stephen J. Cina, MD, colleague, friend, and example.